When you’ve lived in the wilderness long enough, you quickly come to learn what kinds of implements you need in order to survive. Frankly, even if survival isn’t really a problem, you still need the right tools to get the job done. Woodsmen, by their very nature, need to be ready to deal with all manner of troubles, whether they are wandering red-hooded girls getting lost in wolf-infested woods, nasty apple-chucking trees that are trying to prevent a cohort of skipping buddies from going down a yellow bricked road, or even if your responsibilities are more in line with the darkness that has permeated the world ever since you lost your head during the war. And, in each case, there’s only one tool that is right for the job! 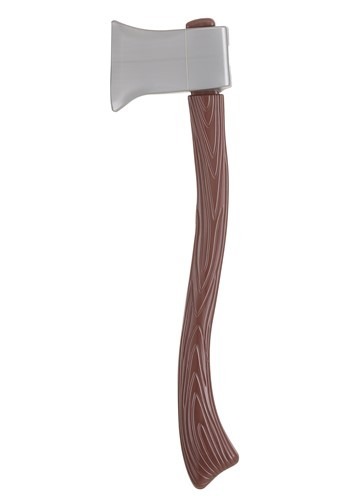 You cannot go anywhere without your trusty Wooden Tin Man Axe. Of course, this exact specimen is perfect in the tin-clasped hands of the reportedly heartless and occasionally rusted Tin Man of Oz, but there are numerous other folks throughout fairy tale history that make use of the ever-important and often-enchanted axe! Admittedly, as the implement is made of plastic and is also not sharp, it won’t really stand up as a solid weapon against the serious offenders of the fantastic kingdoms, but it will certainly do the job of making you look ready to take care of them anyway! The axe is awesome and perfect for my Tin Woman costume. :) Love it.